Crocs have ruined my life. 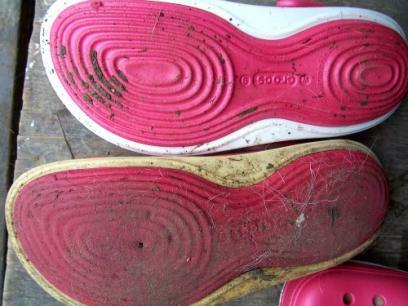 Above: Croc Pair Comparison: the worn down shoe is from my very first pair, at 3 months of constant abuse as a pair of recreational-and-work-shoes. 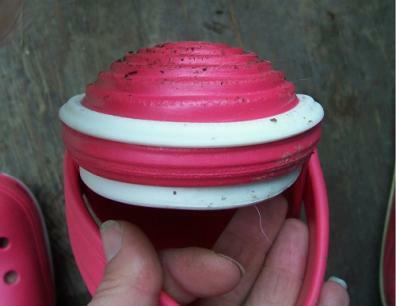 The new one has been gently used (evidenced by the gunk already stuck to that pretty Watermelon pink tread). I used to get the $4 Buy one, get-one-pair-half-off fake clogs. Thanks to trying out real, namebrand Crocs, I can never go back to the $4 clogs. Even if it is SO MUCH CHEAPER. My experiences with Crocs have inspired me to start a Crocs vs Crap: a review of clog brands page --- but I stopped after Crocs. Why review the Crap Clogs ever again?? In Crocs, my feet don't HURT. They used to ache so bad - I would sit and soak and rub lotion and rub and they would hurt SO BAD I wouldn't want to move - yes, it was really that bad. Here I was thinking; "I'm getting old, I have Lymes disease, WHAT'S GOING ON???" Turns out, it was just my damn shoes. I feel bad for horses now! (Can you imagine being stuck in a crappy set of iron shoes... YES YOU CAN. My new Crocs have sunk in the heel area; I will have to get before and after pictures. But it doesn't change the comfort. There is still a good 3 or 4" of cushion to the heel alone so I am pleased. Where the ball of my foot fits, where I always wear holes in the shoes, is still thick and doesn't hurt my feet to walk in. I can RUN in them and it doesn't hurt! I didn't realize how much I wasn't moving around just because my feet hurt so bad. I did chores, sure, but now I am running up and down the driveway with the dogs again to play ball like we used to do (last year, I wore lace up tennis shoes for work a lot - didn't realize what a difference shoes made) so I would like to take a moment to lay blame on the crappy shoes for alllllllll my weight gain. ;) Okay, okay - but a few pounds, right? 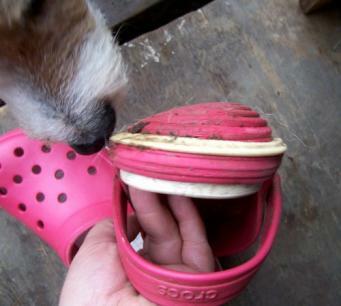 She tried Crocs, and sent a hilarious note telling us that now she could never go back to the crummy cheapie footwear ever again either. So althougth I will whine and skimp on other things in order to afford them, these Crocs are worth every penny. Crocs. They are really that awesome. Above: Before and After shots of the heel to the Skylar Croc Clogs. That wear down happens after 3 months for me, but I walk a few miles every day over some pretty rough Mountain terrain. Comfort is very important as is Easy On, Easy Off (but not too easy; the Cheapie clogs have flown off my feet as I'd scramble up or down an incline, especially in the rain which made things dangerous).